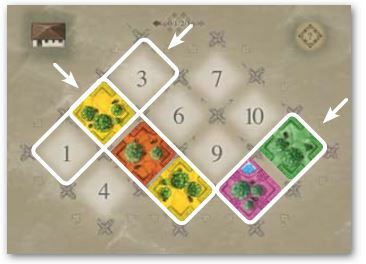 Players can place plantation tiles to expand a group of matching tiles they already own, or they can start a new group by placing a tile on an empty space orthogonally adjacent to a finca (so long as the four starting points next to each finca contain tiles of different colours). 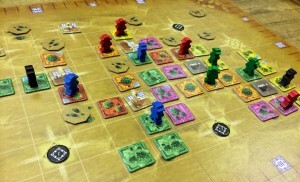 Players place one of their workers on each of their groups of tiles to show they own it. Placing tiles on some specific board locations gain the player a landscape tile which give extra points or special actions. This is the market board with a few remaining tiles on it. The arrows show some of the rows that could be purchased. When all 8 spaces surrounding a finca are completely surrounded, it is scored. All the tiles in any group that cover any of the 8 spaces around the Finca are counted. The players with the most, and second-most, plantation tiles connected to the finca score the points shown on the finca. When harvesting, a player removes their figure from one or more group of tiles which makes the tiles unowned (neutral). In return, the player (a) scores points, and (b) earns some cash based on how many workers he has on the board (the more workers on the board, the lower the income). A player can add a group of neutral tiles onto their own group of tiles by placing a tile to join them (so ling as the neutral group is smaller than the one it’s being joined to and the colours are the same). When all the plantation tiles have been built, the remaining unfinished fincas, unharvested plantations, and bonus points from landscape tiles are scored. Citrus isn’t a complex game but there’s actually far more to weigh up and decide upon than it seems on first inspection. I like the marketplace mechanic with its strange shaped grid as this delivers some interesting purchasing decisions and adds some extra player interaction too. You want to purchase many colour tiles in colours that help you, but you also have to be able to afford the whole row (which isn’t always easy) plus you have to be able to place all them too. You can try to buy colours that other players may want too. Players aren’t allowed to place tiles that will join two plantations of the same colour that are owned by players together. Whilst this means there are no hostile takeovers in this game, it means some tiles can not be placed some locations and this adds a lot of tactical blocking play to the game. In fact, it’s valuable to work out and realise where these are. Gaining cash is absolutely vital because without cash you can’t buy tiles and expand. Worse, not being able to buy means you can be forced to harvest when you don’t have any workers on plantations that you want to remove (because their plantations could still earn points when a finca is scored. So, having at least one worker on the board who can be harvested without too much impact is a good thing – but not too many as that means lower income. Like I said, there’s a lot to balance. 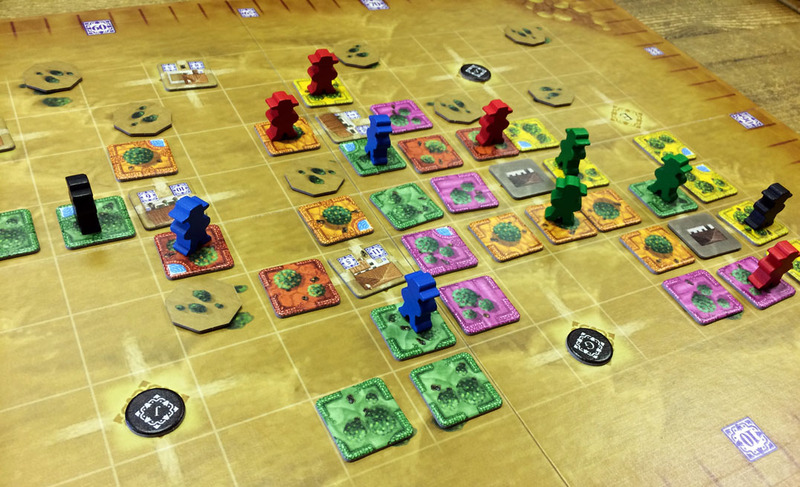 It is tempting to try to dominate a finca early on but this can disincentivise other players to help complete because you’ll get the most points. The same goes for building a lot around a site where a finca will be built later – you’ll probably need to be the one to trigger placing a finca there as other players won’t want to place one there (unless it’s a lower scoring one when they will happily oblige). Ideally, you want to build plantations that touch several fincas so that one group scores multiple times. As a result, it’s important that other players try to stop this. Also, the bonus tiles (collected by building over various spaces) can be very useful and score points that aren’t known until the end of the game. There’s a lot of interaction as players buy tiles, place tiles, and try to generally do the best for themselves and at the highest annoyance to their opponents. You can plan ahead to some extent in terms of knowing which coloured tiles you would ideally place where; however, the tiles you want aren’t always available and other players may get in your way, so you need to think on your feet a lot too. The only downside to Citrus I found was that the rules feel a bit disjointed when you first read them. Every point seems to be covered but just not quite in the order I expected; however, it’s more obvious once you start playing and I didn’t find it a hindrance. I really enjoyed Citrus which is a fast-moving and colourful-looking eurogame with plenty of tricky decisions and elements which are never easy to balance (which is a good thing). A nice touch is that the board has two sides to it – the smaller side is for shorter games with fewer players. The larger side also has impassable spaces on it too. 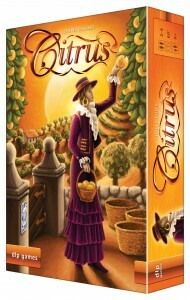 This entry was posted on Tuesday, December 10th, 2013 at 8:25 pm	and is filed under Board Game Review, Board Games, Citrus, Essen Spiel 13, Spiel 2013. You can follow any responses to this entry through the RSS 2.0 feed. You can leave a response, or trackback from your own site.